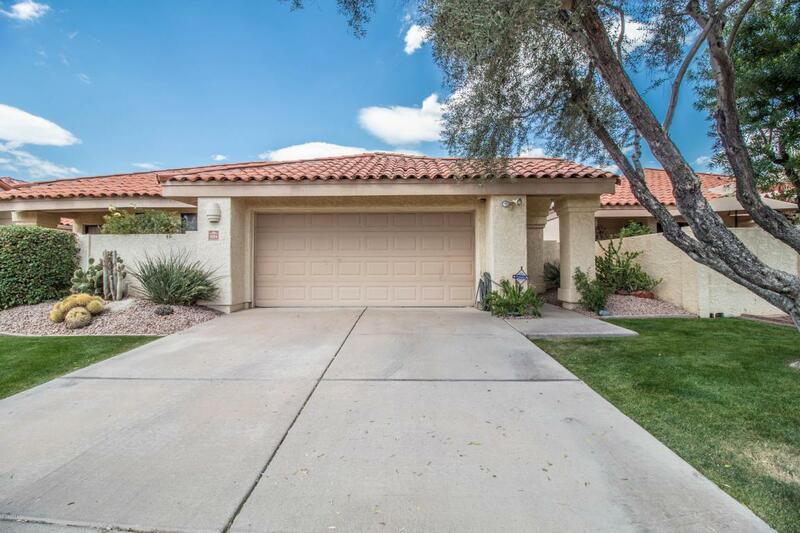 Situated on an ideal North/South exposed lot in the beautiful lake subdivision of Scottsdale Ranch, this stunning, move-in ready home offers 2 bedrooms, 2 full bathrooms, a den, + a 2-car garage with built-in cabinetry. Awash in natural light, the interior features a lovely double door entry, soothing neutral colors, soaring high vaulted ceilings, and a recently remodeled kitchen with a breakfast bar, Corian countertops, light grain cabinetry, and a brand-new stainless-steel appliance suite that stays with the home! This home is equipped with a Trane A/C unit and the furniture and art are available on a separate bill of sale! The community of Scottsdale Ranch includes a biking/walking path, clubhouse/rec room, tennis courts, and sparkling heated community pool and spa.